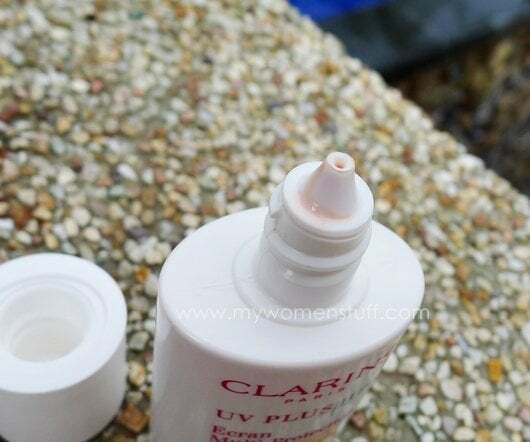 Home » Product Reviews » The Clarins UV Plus HP SPF40 Sunscreen and I are inseparable! The Clarins UV Plus HP SPF40 Sunscreen and I are inseparable! Years ago… or maybe just over 2 years ago, I thought I’d found THE ONE. The perfect sunscreen for me. I do still use it, and I do still like it. But I’ve come to realize that its no longer THE ONE. Unlike the many others I’ve been trying thereafter, I found it was heavier and oilier on my skin. Uh-oh. What am I going to do with that almost full tube 😛 One of these days I should do a sunscreen compilation eh? 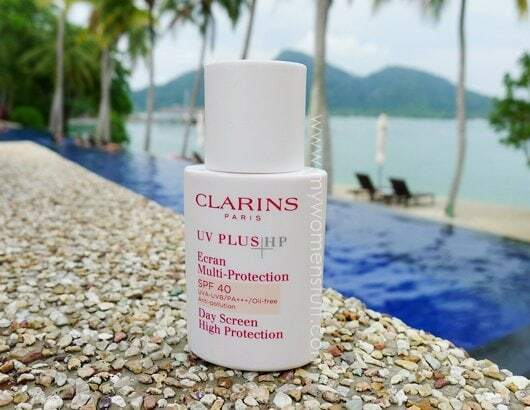 The Clarins UV Plus HP Day Screen with SPF40 is an upgrade of the previous Clarins sunscreen. This time, not only does it shield your skin from those harmful UVA-UVB rays, it contains cantaloupe melon extract which has anti-pollution and anti-oxidative properties on the skin. My first reaction upon seeing this bottle was “Oh gosh! Its tiny!” It just fits into my palm. I have this strange perception that sunscreen must come in gallon cans (because I’m very liberal with its use) but this is quite a small wonder! The first thing I noted was the consistency. 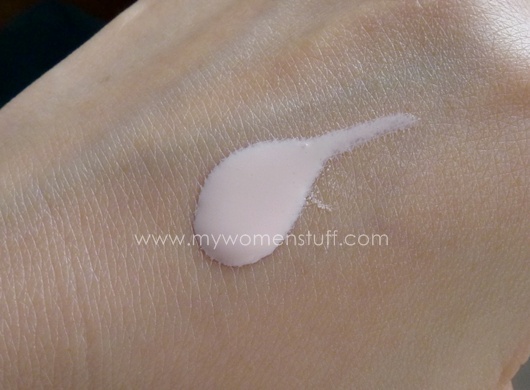 It has a liquid lotion consistency that spreads easily, but isn’t quite like water. The Clarins UV Plus HP sunscreen comes in 2 formulations – transparent and tinted. The tinted version has a pink band on its name because its a pink tint. Strange? Not really. This very light pink tint actually helps brighten your skin. So this one functions both as a sunscreen and as a makeup base too. I’ve worn this one everyday since I got it over 2 months ago. I took it with me to the beach and I took it with me on holiday. To say we are inseparable is a bit of an understatement, because I’ve really grown to like this. The best part of course, is that it is very light on the skin and isn’t oily whether on application or after that. It isn’t drying on my skin and I find it makes a good base for makeup, whether due to the pink tint or its texture. You can use the piano method to apply this sunscreen, but I don’t. I apply this one using the dot and apply method i.e. squeeze out on finger, apply, squeeze on finger, apply etc, all over my face. Quite a lot used, but I’m liberal with sunscreen. You also have to shake it before using, to mix up the formula, I’m told. If you don’t shake it, the texture is more watery and its thicker after you have mixed it up. There is a scent which I would really have been happier without but I guess you can’t win ’em all. 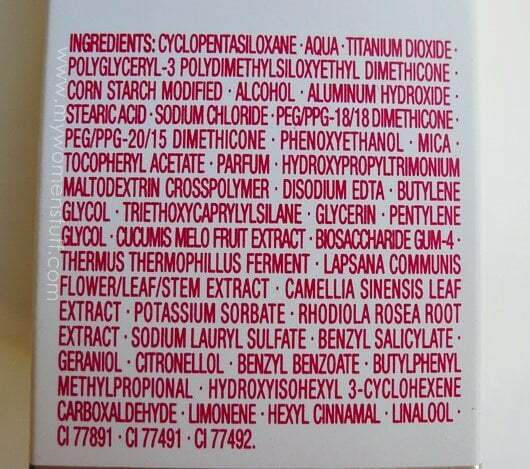 Here is the ingredient list for those who are interested in what it contains. PREVIOUS POST: First 10 days of 30 Days of Lip Swatches : Did you miss any? this is a great product. i was planning to get backups when i was in sdyeny but it wasn’t sold there. now that you have reminded me, i am getting a bottle soon. it’s really a good SS for sure. i love it too. Might be better to just pick it up here since its likely to be pricier in Sydney 😉 Its a great sunscreen and I’m glad to have been introduced to it! Yes, I have this. Luv it! The other one I like is Guerlain with SPF50. Use both of them interchangeably. If I have to leave office for an appointment it will be the Guerlain. You might want to check out Cosmoderm, sold at phamarcies. I’m using the tinted version on week ends when I don’t use make up and I do like it a lot as it serves as a light base. i love it too! esp how the pink tint makes my skin really radiant 😀 can’t wait for the bigger size to reach! I liked the texture of this suncreen too as its light and absorbs to skin quite readily. The pink tint just makes you have that ‘rosy’ look too. However, am using MVO Suncreen now and liking it a lot! MVO is a good sunscreen. I just hate that its so hard to get (coz of the whole online thing) but its great stuff! Actually, I emailed directly to them on my orders( as you did ) and they were very helpful and prompt. My products came in within 1 weeks time! And they are very, very generous on their samples. It’s a pity that you missed out on trying their anti-aging oil. It is a savior to my often dry skin. I’m currently using Shiseido Anessa Perfect UV SPF50 PA+++ and it neither too matte or too moisturizing. RM105 for 60ml. That’s one I haven’t tried but I’ve heard a lot of good things about. Glad it works for you. i’ve tried this before but whilst i was happy with the actual product, i wasn’t quite happy with the bottle. for some reason, even while the cap is on, it tends to spill out. i’m not sure why. anyone with the same problem? I’m using Cellnique Total Day Time Protection 30, find it’s good and not so pricey at Clarin. Darling, is it water resistant, i.e. go through all the sweating and tearing under the sun at all? I am using Lancome for normal use but most of the time, I need something like Clinique (kinda thick) to hold up! Ooooh nice one. Makeup base and sunscreen sounds pretty good to me too (I sit in the office all day looong too). How do you find it comparing to Biotherm UV Supra and Kiehl’s one? Better? Watery and not so moisturizing? I am loving both but Kiehls is really nice during the cold season now. Its more watery than Biotherm and Kiehl’s. In terms of texture I’d put it at Biotherm -> Kiehl’s -> Clarins from thickest to lightest. For oil factor I’d rate Kiehl’s -> Biotherm -> Clarins from oiliest to least oily (very relatively speaking). I do still like Biotherm and Kiehl’s. And I still hate the prices! LOL! Oh yay! I’m so glad to hear that you are loving this sunscreen too! You know, I recently reviewed the transparent version, which I’m totally loyal to ever since I got it! Too bad the tinted version is not available over here in my country, Would also like to try it out. Oh? They don’t send the 2 versions everywhere? I didn’t know that! I like it cos it functions as a base too (cuts down on more makeup) 🙂 Glad to know this one works for you too. So fun to find a product that so many people like! I used this many years ago in the old formula. Think they have reformulated twice since. I need to pick up a new sunscreen today and may get this. do you use a moisturizer under this, or does it provide adequate moisturizing? I have dry/sensitive skin and living in a city is really harsh on my skin!! I use the Clarins suncare creams for swimming and they are great, but i urgently need an everyday one for my face… I am currently using elizabeth arden 50spf – but the smell is not my fave! Yes it’s necessary to use moisturizer under this sunscreen. I use it at the end of my skincare routine. It isn’t drying but it doesn’t moisturize if you don’t already have moisturizer on. Hi! I’ve been searching review on this product! Lovely~!! Nope, the pink tint is very subtle and actually helps brighten the skintone a little. I think its worth a try because with the sun protection, you shouldn’t be turning red if you dont’ stay out in the sun too long.